A book read from cover to cover is a rare read. Front cover text, Publisher, Glorious Cover Image, Inside Flaps (About the Book and About the Author), the Copyright page, and the Acknowledgments. Included in this pleasure, an enjoyable Introduction, before, finally, settling upon the text. The Place That Inhabits Us is that kind of rare read. 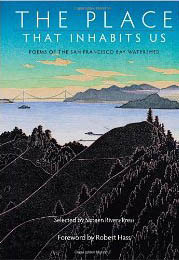 The Place That Inhabits Us is a book of Poems of the San Francisco Watershed. “From the granite slopes of the Sierra to the Delta, through the Coastal Range to the bay and shores of the Pacific, one hundred poems map this improbable region, a cultural crossroads where East meets West.” The Place That Inhabits Us is a Sixteen Rivers Press book. Sixteen Rivers Press lists 24 other books of poetry published in the past 12 years of the publishing house’s existence. The cover is a woodcut image, “Golden Gate (& Mt. Tamalpais) from Grizzly Peak” by Tom Killion. Regard that beautiful cover. Fine detail and a presence of fading daylight. The perennial fogbank waits patient at the Gate. Along the edges of water sources were paths. Water creates gullies, breaches in the sediment, yet, along the shoreline, within the mean tide line, is the space in which people traveled. We do not know the names of our earliest authors who told the story of Coyote, Turtle, and Rattlesnake. We do know the names of those Calibornia boys who chorused, “I wish they all could be California girls.” After Robert Hass’ Introduction to The Place That Inhabits Us, we meet the 100 authors of the poems of the San Francisco Bay Watershed. I will share one here, I would like to share at least a dozen. Buy the book to enjoy the other fine poems published in this wonderful watershed anthology. light and life. There is no place you ever knew me. for life and death, is the same. I love his work too. Beautiful. Love Killion’s work! thanks for linking this.